This page places Hickman’s 2010 newspaper article (link) as part of a sequence of interlinked, international events and reports of events relating to the launch of the iPad, the suicides at the Foxconn factory, and the repercussions for factory workers in China of Apple’s response to the crisis. San Francisco, January 27th 2010: at an invitation-only event, Apple CEO Steve Jobs unveils a thin, light, aluminium and glass ‘multi-touch’ tablet media player called the iPad. It is, he claims, a ‘magical and revolutionary device’ which ‘creates and defines and entirely new category of devices that will connect users and their apps and content in a much more intimate, intuitive and fun way than ever before’ (in Apple 2010a). A video of his presentation is posted on the Apple website, YouTube (see below) and elsewhere and the iPad is news around the world. Online, March 31st-April 1st 2010: iPads distributed to a small, select ‘inner circle’ in advance of their sale are reviewed in mainstream North American media outlets – like Time magazine, ABC News and The New York Times – and on specialist blogs – like boinboing.net and the Root (Agarwal 2010). Readers submit hundreds of online comments in response, and these reviews are read, commented upon, and written about worldwide. April 3rd 2010: the iPad goes on sale in the USA. Reports describe people queuing for days to be the first to get one in store. Customer reviews quickly appear online and in the press (Apple 2010b). 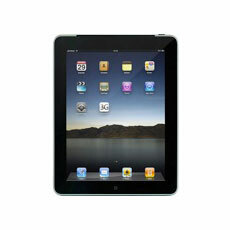 May 3rd 2010: Apple announces that one million iPads have been sold (Apple 2010c). Jobs states that “Demand continues to exceed supply and we’re working hard to get this magical product into the hands of even more customers’ (in Apple 2010d). May 28th 2010: after delays caused by massive sales in the USA, the iPad goes on sale in Australia, Canada, France, Germany, Italy, Japan, Spain, Switzerland and the UK (Apple 2010e). Similar scenes, stories, reviews, comments and discussions are reported in the press (e.g. Naughton & Ahmed 2010). May 31st, 2010: Apple announces that two million iPads have now been sold. Jobs says of those still waiting, ‘We appreciate their patience, and are working hard to build enough iPads for everyone’ (Apple 2010e). June 22nd, 2010: Apple announces that three million iPads have now been sold (Apple 2010f). May 28th, 2010: three days after SACOM publishes its report, the front page of a UK national newspaper – The Independent – brings the two strands of this story together in a starkly visual way. Beneath the headline – ‘A gadget to die for?’ – is a photograph of two objects in a spotlight. They’re the same size and shape. One is an iPad. The other is a framed photo of a young Chinese man. The text beneath one reads, ‘This is the iPad, the most eagerly awaited consumer product of the year, available in the UK from tomorrow’. 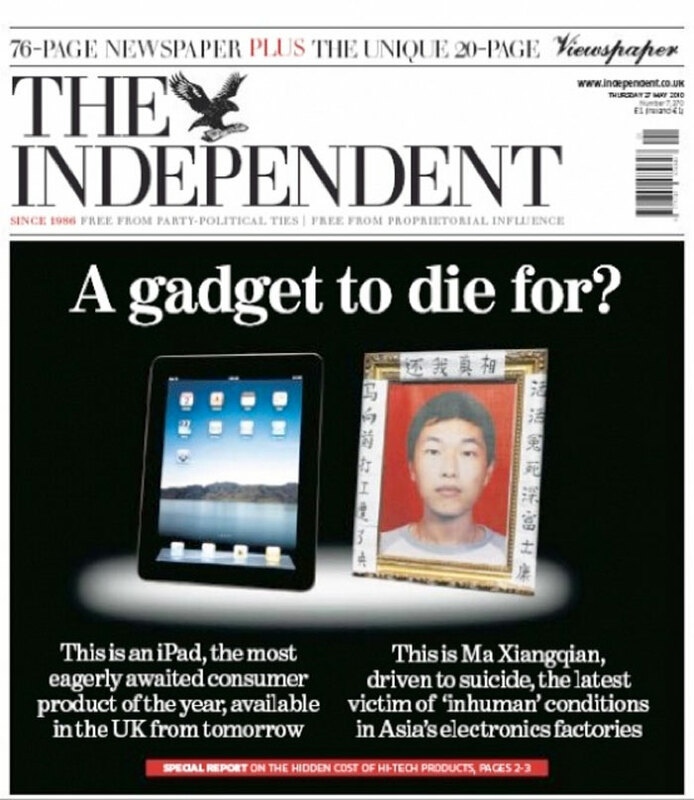 The text beneath the other reads, ‘This is Ma Xiangqian, driven to suicide, the latest victim of ‘inhuman’ conditions in Asia’s electronics factories’. His suicide is detailed in SACOM’s report, and his family take this framed photograph with them to protest and mourn the Foxconn deaths (see Barboza 2010, Pomphret & Soh 2010). Apple is embarrassed by this and hundreds more mainstream and online media stories taking about the iPad to the ‘Foxconn suicides’ in the same breath,² and journalists around the world track the fallout from the story over the following days, weeks and months. June 2nd, 2010: Steve Jobs claims the Foxconn factory is not a ‘sweatshop’, that its suicide rate is lower than the USA’s, and that Apple is ‘on top’ of the situation (Beaumont 2010). A worker dies after working a 34 hour shift (Hannaford 2010). June 3rd, 2010: Foxconn raises basic Shenzhen factory wages by a third (Moore 2010c). SACOM declares June 8th, 2010 a ‘Global Day of Remembrance for Victims of Foxconn’, protests outside a Foxconn shareholder meeting, and hands over a petition endorsed ‘more than 5,000 organisations and individuals from over 100 countries’ (SACOM 2010; Chan 2010b). June 9th, 2010: Foxconn is ‘employing psychologists, punchbags for prostrated workers … and safety nets around its roofs to stop workers leaping from them’ (Harding 2010). on June 10th, 2010: Foxconn pay rises encourage workers in other Chinese factories to strike for higher pay (Foster 2010). June 11th, 2010: Foxconn recruits monks and social workers to help workers with their problems, and workers have to sign contracts promising not to sue Foxconn as a result of ‘any unexpected death or injury, including suicide or self-torture’ (Malone & Jones 2010). June 12th, 2010: an American Apple fan returning from Shenzhen on research for his monologue about Steve Jobs concludes, ‘It’s painful to realise that these things you love so much have blood on them’ (McKeon 2010). July 6th 2010: Chinese factory workers have been following the press coverage online, are coordinating strike action via social networking websites, and are gaining pay rises as a result of their actions (Pomphret & Soh 2010). July 16th, 2010: Apple is no longer the ‘creative, edgy innovator that launched the iPod in 2001’, the reputation of the ‘entertainment and information colossus’ has crumbled (Hickman 2010b). …and you could follow it, comment on it, send links to others about it, write about it on your blog it, create and post a mashup from its YouTube films, contact others to protest about it, write an essay about it … ‘in a much more intimate, intuitive and fun way than ever before’, if you had an iPad. Chan, J. (2010a) Dying Young: suicide and China’s booming economy. Hong Kong: Students and Scholars Against Corporate Misbehaviour. ¹ Search for ‘Foxconn’ and ‘Suicide’ youTube.com for a selection of these bulletins (a selection of 3 bulletins is embedded below). ² A search on August 5th 2020 on the Nexis database produced 346 media stories in English containing the words ‘iPad’ ‘suicide’ and Foxconn. Posted by Ian Cook (last updated March 2011). Video embedded with permission of SACOM. Newspaper cover reproduced for a fee with permission of Independent Print Limited (copyright 2010).